Day Four and Five (08.26.09-08.27.09) While in Indio, Dave and I had his parents' vacant vacation house to crash at. Really, it was the entire reason that Indio was even a destination - or the motivation for the road trip initially. It was so much better than a hotel, not just because it was free, but because it proved to be the perfect escape after a long day of driving, exploring, and generally wearing ourselves out. The house gave us space and time to ourselves. We had a pool, which we each took advantage of to relax in at the end of the day. But probably why memories of the house (and pool specifically) stick with me, is because it was the only part of the trip where we actually did nothing - in the best sense of the word. I'd be swimming while Dave was on his laptop, Dave would be in the house while I sat out by the pool, I'd be going through my souvenirs inside while Dave swam, etc. It was the perfect way to decompress and try to register what we had just done that day. I remember saying to Dave several times that I'm not going to be able to process the entire trip until we actually get back because everything is so new and we just keep adding to the list. It was no surprise that the house proved the perfect location to play catch up and ponder about a little bit of everything. The evenings by the pool allowed me to at least wrap my head around what we'd seen that afternoon, and for a moment, slow things down. I remember the drive back from the Aerial Tramway and because we had a bit of distance to cover to get back to Indio, we went in search of a Walmart so that I could buy a swimsuit and maybe something that said 'Indio' on it - we ended up in La Quinta but found a Walmart anyway. The next night we ended up eating at a restaurant in Indio shaped like a castle with mini-TVs at each station - the combination of the beer, castle theme, and ridiculous TV shows seemed to create a campy mix of awesome. 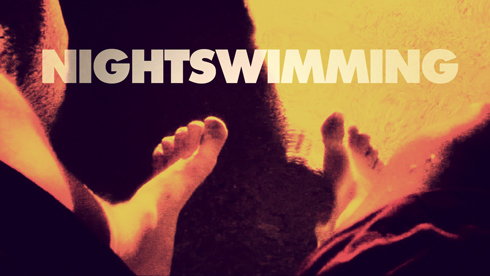 This edit, Nightswimming, is specifically about those relaxed evenings by the pool and the downplayed evenings that we spent driving back to the house or around Indio itself. While not an epic destination perhaps, the trip wouldn't have been what it was without this time to recollect, to swim, to enjoy the cooler evenings and desert air, and to simply remind ourselves exactly where we were.